The nerves of the head and neck include the most vital and important organs of the nervous system – the brain and spinal cord – as well as the organs of the special senses. In addition, in this region we also find the major cranial and spinal nerves that connect the central nervous system to the organs, skin, and muscles of the head and neck. These structures all work together to control every part of the body and receive sensory messages from the environment and the body’s internal structures. The brain is a grayish, highly convoluted organ found within the skull's cranial cavity. The brain weighs in at around three pounds on average, making it one of the most massive organs in the human body. Around 100 billion neurons in the gray matter of the brain control almost all of the body’s activities, including the conscious activities of the mind and the subconscious activities that control the organs and lower bodily processes. The interior of the brain contains mostly white matter that connects the processing areas of gray matter to each other and to all of the muscles and sensory receptors in the body. Yet being an extremely complex organ, the brain can be further divided into many anatomically distinct regions with distinct functions. - The base of the brain that connects to the spinal cord is the brain stem. Lower brain functions related to breathing, heart rate, and reflexes are controlled by the brain stem. - The cerebellum is a round, wrinkled mass of neurons posterior to the brain stem that controls coordination and balance. - Superior to the brain stem is the diencephalon, which controls the endocrine system, relays messages to and from the higher regions of the brain, and regulates feelings of hunger and thirst. - The largest, most superior, and highest functioning region of the brain is the cerebrum. All of the voluntary functions of the body, along with memory, creativity, and emotions are products of the neurons in the gray matter of the cerebrum. A large crease splits the cerebrum into left and right hemispheres, which monitor and control opposite sides of the body and maintain slightly varied but parallel functions within the brain. Extending from many different regions on the inferior side of the brain, twelve pairs of cranial nerves provide direct connections between the brain and important structures of the head, neck, and trunk. The sensory organs of the head use the cranial nerves for signal transmission, including smell (olfactory nerve), vision (optic, oculomotor, abducens, and trochlear nerves), taste (facial and glossopharyngeal nerves) and hearing (vestibulocochlear nerve). 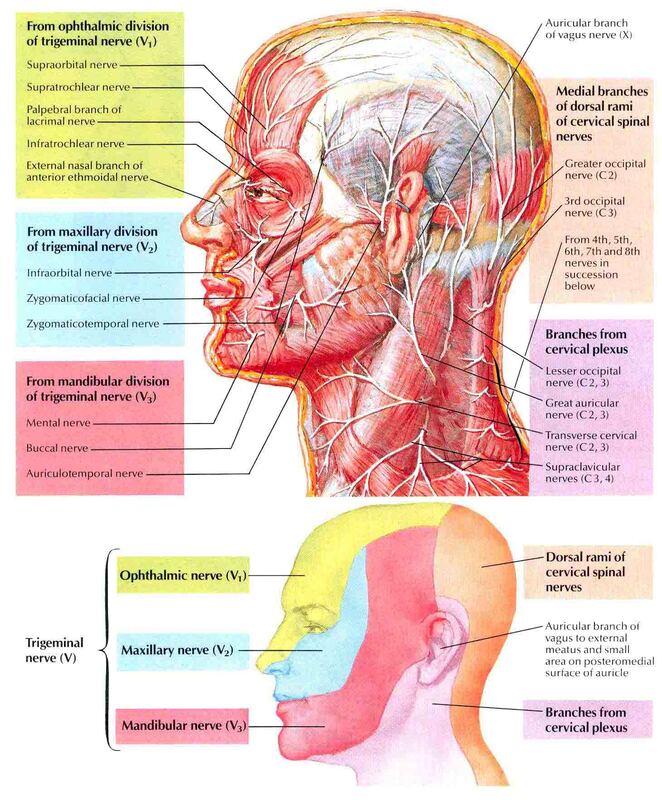 The muscles of the head and neck are also controlled by various cranial nerves including the facial nerve (facial expression) and accessory nerve (head and neck movements). Wandering through the neck and torso, the vagus nerve communicates vital information from the brain to the heart and intestines. The spinal cord is a thick nerve trunk that forms the brain’s most important connection to the body and carries all signals to and from the brain that are not provided by the cranial nerves. The spinal nerve extends from the inferior end of the brain stem and passes through the foramen magnum of the skull into the neck. In the neck, the spinal cord passes through the vertebral foramen of the cervical vertebrae, which surround and protect its delicate nervous tissue. Eight spinal nerves branch off from the spinal cord in the neck to form a network of nerves called the cervical plexus. The cervical plexus forms many connections between the brain and the skin and muscles of the head and neck, similar to the cranial nerves. A vital connection from the cervical plexus to the diaphragm is formed by the phrenic nerve, allowing the brain to control breathing. Damage to any part of the spinal cord may cause a loss of sensation and/or motor function below the injury; however, such injuries are most dangerous within the neck as they are likely to affect a greater area of the body and are more likely to result in death. The fatal result of damage to the pathway between the brain and the diaphragm is respiratory arrest, a condition where the diaphragm stops moving, thereby failing to move fresh air into the lungs.